I grew up in the beautiful countryside of West Dorset where I had woodlands, fields and the coast at my disposal. I would take my dog for hour long walks in the woods, listening to birdsong and watching the wildlife. I was taught how to birdwatch, and eventually I was teaching myself to identify everything I saw or heard. To this day I pride myself on being able to identify a bird by its flight pattern! I have been an artist for as long as I can remember. It was the one subject in school that I really cared about so when the time came for university, I went to Falmouth College of Arts to study illustration. This was home from home for me - beautiful coast and countryside where I continued to study nature alongside my art, with an ever growing interest in science, and this is where my two big interests merged for good. Ralph Steadman has been a long time influence for me. His erratic style is something that really resonates with me - I love how the ink flung across the page energises his work, making his characters come alive while they spit sarcastic satire out at the viewer. I gradually started working ink into my art, and now it is the only medium I really use when drawing in colour. I love creating a piece, then splatting the wet ink across the page to finish it off - I do not consider an artwork finished, nor am I happy with it, until it has these splats and splashes. I love being messy with the ink which creates a free and animated texture, extending the movement of my subject through the medium - I feel that my animals come alive by doing this. 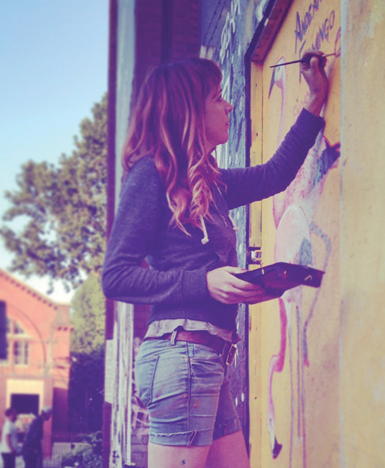 I am currently part of a wonderful collective of artists all working in this way. The show we put on is called ‘Human Nature’, and it explores a huge variety of subject matter, mediums and opinions from bronze sculptures detailing our relationship with fossil fuels to huge paintings of British birds which are at risk of being wiped out. My own work for the show is a series of detailed paintings exploring the ever expanding relationship between animals and technology. For example, shark skin contains scales which resemble tiny teeth called dermo-denticles, and the nature of its structure prevents barnacles and other organisms from attaching to the shark’s skin. Researchers have reproduced this structure into a silicone which reduces this ‘bio-fouling’ by up to 67%. This could have huge implications for preventing infections in medical care, and the silicone could be a material which all hospitals will use one day. This is just one example, and my research has only just scratched the surface. The nature of science and progression in technology means that there will always be new discoveries to learn about. This is a series which I can see myself working on for the rest of my life. I will paint an animal which inspires me, and this often comes from direct experiences, but his doesn’t always mean wildlife. 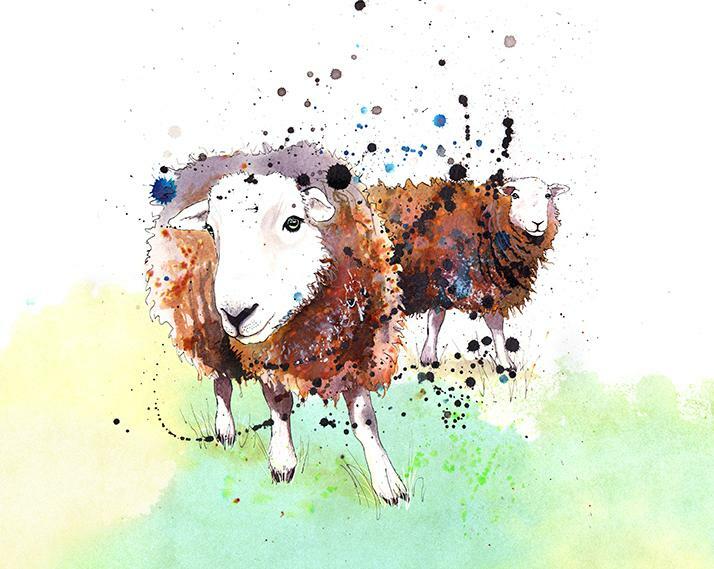 The sheep in this illustration belonged to my brother who lives in Dorset, managing several acres and several hundred sheep. These two ewes are a breed known as Herdwicks, native to the cold and rocky Lake District region of Cumbria. I love the curious look in their eyes as they investigate the viewer and this image reminds me of home. The rutting stags were another image conjured up by experience. A few years ago I visited Richmond park in west London with my husband so that we could experience what’s known as ‘The Rut’ - the season during which males will fight for the right to mate with the hinds (aka does). The biggest and strongest stags will inhabit the largest patch of land with the most females on it. 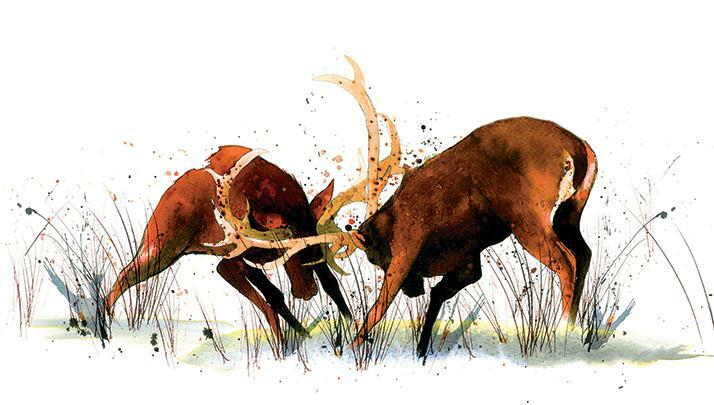 Any other males who feel they could take on their competitor will approach, and the pair will run at each other in an aggressive and noisy display of rutting antlers. The winner will chase the defeated stag away and continue defending his females like this for up to three months during Autumn and Winter. It is a real test of strength, stamina and dominance for them. I loved how my inky splats could convey the harsh movements of the battling stags, throwing up bits of earth and grass into the air as they fought. It’s an amazing spectacle to watch and I would recommend everyone to go at least once! The third picture is very special to me, and has a story attached to it which I love to tell. In 2011 I flew out to India with a friend so that we could fulfil our dream of travelling there together. We decided we had to visit Ranthambore National Park, renowned for is large areas of undisturbed and protected forests, housing many species India is known for. We were picked up from our hotel by the park rangers at 5.30am. The forest was absolutely quiet as the sun came up and the only sound I heard was that of our car’s tyres gently rolling across the dirt as we entered the park borders. After a while we stopped and one of the rangers stood up in the car with his binoculars to look around. Everything was deadly still. The sharp, loud alarm call of a monkey abruptly sliced through the silence and without hesitation the ranger sat back down, pointed to the right and the driver shot off through the undergrowth as fast as he could. When we arrived at our destination, a few other cars were already there. As the dust settled, someone whispered excitedly, pointing to the undergrowth where some movement caught my eye. A huge male Bengal tiger was making his way towards us. As he came out into a clearing in front of us I could see just how big he was - 3 meters long, about 230kg and with a full belly. He nonchalantly strolled just meters from our car as we gazed on in shock. He was beautiful. All of us watched him in total silence, and after a couple of minutes the tiger disappeared into the undergrowth once more. We were left feeling utterly emotional. My friend and I were sobbing through sheer disbelief and amazement that we had witnessed one of the planet’s rarest creatures in the wild. 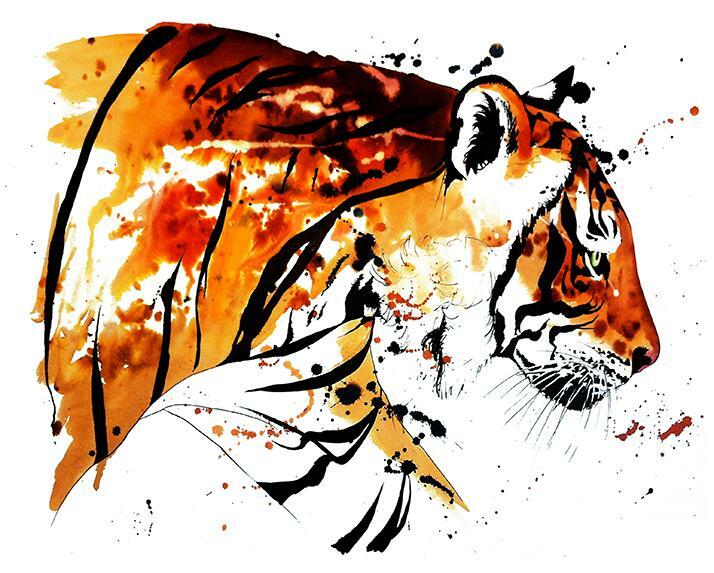 When we returned from our trip, I looked back over my photographs of the tiger and salvaged just one shot, and from that photo I painted this portrait. I gave the painting to my friend as a memory of the extraordinary experience we shared together that day. I know neither of us will ever forget it. To this day I am still so grateful that I had the opportunity to see a wild tiger with my own yes - I know I will never get a chance like that again. I want people to look at the animals in my paintings and see them the way I do; vivid, exciting and endlessly fascinating. I love how they move through life the only way animals know how; with purpose and conviction, without hesitation or confusion, always unknowingly changing through evolution and natural selection, fitting perfectly into the world which surrounds them, always moving forward, always fighting for survival, just as they have for millennia. I think we can learn a lot from the creatures we share our planet with.